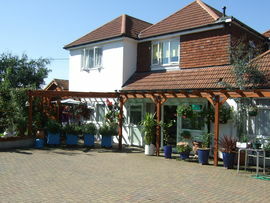 We are a modern family run B&B in Upper Beeding, between Brighton and Worthing on the South Downs Way. We have seven bright & spacious, purpose built en-suite rooms, all with TV/DVD, hairdryers and tea & coffee making facilities. All bed linen is Egyptian / 100% cotton. 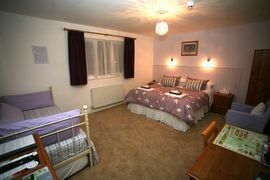 The two ground floor rooms have level access, with one being suitable for a wheelchair user. One has a king-sized (5') bed and the other a super king-sized (6') bed which can be converted to 2 single (3') beds if required. The five 1st floor rooms have views of the Downs and consist of three rooms with super king-sized (6') beds and walk in showers, and two rooms with super king-sized (6') beds and bathrooms. 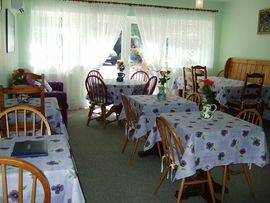 Two rooms can be family rooms taking up to 4 people. All but one of the super king-sized beds convert to twin beds if required. 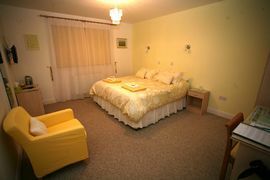 Two of the rooms can be Family rooms, taking up to four persons. We also have a private car park for those guests arriving by car or bike. Disabled Facilities: There are disabled facilities. Two level access rooms, one suitable for wheelchair user. Pet Facilities: Pets are not allowed. No pets in house. Special Diets Provision: Special diets are catered for. Vegetarian and Gluten Free - any other by prior arrangement. Smoking Facilities: Smoking is not allowed. No smoking in house. 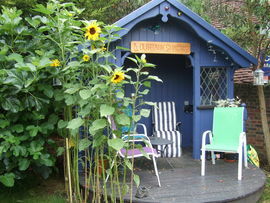 New B&B awaiting assessment but expect to achieve high rating.